Yesterday afternoon I made time to make stuff. It’s so easy to get wrapped up in work and endless to do lists that sometime these simple acts of creativity can get forgotton. There are so many things that don’t get finished or need staying on top of constantly. It’s a busy world and I feel that by taking up various craft processes you can achieve that sense of completion, of making something and finishing it. Therefore! Below is a recipe for tapping into your creative side, and having a jolly good time while you’re at it. Enjoy! – Some ideas: think what you’d like to try and make, whether it’s a project you’ve been wanting to work on, a technique you’d like to try. – Materials: Use the resources you have around you – fabric, paper, scissors, old carrier bags, printer, pens….the list is endless. You could raid your wardrobe for clothes you haven’t worn for a while. Make one thing into something else! – A notepad – for writing down the brilliant ideas that may stumble your way. -A camera – take some pictures of your handiwork and fun! Yesterday my friend Alex came over, and we spread books and materials all over the floor. When our conversation turned to felt making I remembered I had some felting needles and roving: I found them. So we then had a go at needle felting, using a needle, a piece of foam and some bright turquoise felting wool. It’s surprising how much wool you begin with, but then the more you poke at it the fibres start to blend and get smaller. We made the small turquoise owl. 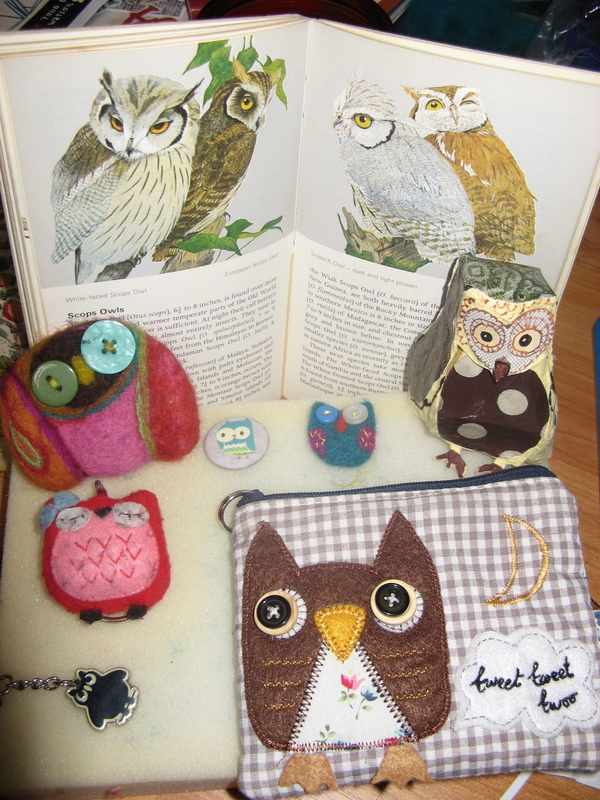 And then realising we had quite a lot of owl-related paraphernalia, took the above photo! So, schedule a date – maybe next week? – when you can set aside some time for being creative. It’s so refreshing, and very addictive!